When you rely on streaming services to gain access to various shows, it means that you'll end up watching them at least a season behind the current one and certain aspects of the game can totally slip by you. And that's been my relationship with Dark Matter as of late as I've relied on iFlix to keep me more or less up-to-date. This show was oddly memorable for me when it came out as SyFy pretty much paired it with another science fiction series called Killjoys. Both came across to me as being okay but not amazing but at the same time it was just refreshing to see SyFy investing in actual science fiction shows instead of some of the stranger stuff they've thrown money at, even if only just for distribution. This second season continues to build on the larger mystery of the show and really bringing everyone into conflict with their forgotten pasts with some rather violent results. All that and some larger conspiracy mystery meta-plot? Cool beans. 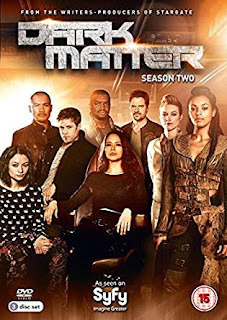 Synopsis: Dark Matter is a science fiction television series created by Joseph Mallozzi and Paul Mullie based on their comic book of the same name. As of the time of this review the show has had a third yet final season after this one. This starts with Two (Melissa O'Neil), Three (Anthony Lemke), and Four (Alex Mallari Jr.) imprisoned at the Hyperion-8 Maximum Security Galactic Detention Facility after Six (Roger Cross) had betrayed them given his original identity as an officer of the Galactic Authority. One (Marc Bendavid) and Five (Jodelle Ferland) are also there but aren't immediately made to join the general population. And the reason that One doesn't get sent in with the rest turns out to be he's actually CEO of a major corporation and his lawyers naturally get him free once he's discovered on Hyperion-8. Eventually the remaining crew of the Raza manage to escape from the prison (or otherwise the story would never go anywhere) but that's just the start of their problems. And in their escape they pick up new crewmen from the prison that include Devon (Shaun Sipos), who at least has the skills of a doctor and Nyx (Melanie Liburd), who seems pretty handy in a fight. But of course they also have their own stories and inevitably their own complications that will also endanger the Raza. What I Liked: The original identities of the crew of the Raza will always be a major plot point and this second season really pushed how to get them further involved in the main plot. It seems that everyone's pasts are coming back to haunt them in a serious way and that theme rolls over to include the two new crewmen of the Raza. I also appreciated the growth they tried to craft for the Android (Zoie Palmer). Beyond becoming less robotic in her demeanor, she also has some interesting stories of her own whether involving the crew or just on her own. And it hasn't been an overly big leap in logic in terms of how things progress to where they get to by the end of the season. What Could Have Been Better: The second season went in some weird directions in order to keep pushing the story forward, as it were. The most striking and perhaps memorable (whether for better or for worse) moment in the show is when they somehow cross over into an parallel universe complete with alternate versions of themselves. I wasn't expecting the show to go into "Mirror Universe" territory so early in the show's run but I guess they were eager for crazy plots. A lot of the drama around past versus present personalities of the Raza crew was a totally mixed bag of the good, the bad, and the strange. We have characters dying left and right but not dying because there's more going on with identity theft stories and of course the parallel universe angle to things. So much going crazy all at once. TL;DR: Dark Matter is still an interesting show with a lot of effort going into exploring new ground, But there's only so much you can do with amnesiacs on the run and I'm not sure if a near-magical drive unit was the right way to go. And thus the season gets 3.5 cases of people knowing who the crew of the Raza were before out of a possible 5.